Quantitative Easing for the people: the antidote to market fundamentalism? Now, looking back over the last 10 years, in the years during the financial crisis and the messy conclusive period when the UK economy (kind of) levelled out, it does us some good to ask: did market fundamentalism work? When I say market fundamentalism, I mean it as a pejorative term which defined the thinking that free market policies would end up benefitting everyone in the end, even if unintentionally. And unless you’ve been watching a broken television or reading newspapers upside down you’ll probably agree with me that those policies didn’t work out too well. Well, not for most people anyway. What’s resulted is rather interesting. Rather than Left and Right being at loggerheads, some rather strange alliances have formed. Just look at the case of ‘Helicopter Money’. This describes the economic response to weak demand as literally dropping money on the heads of a country’s citizens from a helicopter, so people pick up the money and spend it. Simple. Interestingly, post-crisis, this idea – first theorised by Milton Friedman whose book Capitalism and Freedom in 1962 came to influence Margaret Thatcher’s economic reforms of the 1980s – has been picked up by Left- and Right-wing economists alike. How this happened is through opposition to how Quantitative Easing money has been spent. According to the Bank of England in 2012 Britain’s richest five per cent gained most from quantitative easing and the richest 10 per cent saw the value of their assets increase by up to £322,000. However, much to the surprise of many economists what didn’t result as a consequence of ‘bailing out the banks’ – which is what Quantitative Easing is more commonly called – was hyperinflation. Listening to Lord Adair Turner, former chairman of the Financial Services Authority, speak at an event recently, he notes that if anyone had told those to whom he refers as “official economists” that for the following seven years there would be near-zero interest rates and a £375bn Quantitative Easing (QE) programme they would have said ‘wow that will cause drastic inflation!’ Not the case. This has given commentators and economists the guts to suggest that maybe a programme of Quantitative Easing for the people is something that could feasibly take place without worrying about hyperinflation and that could, consequently, help people get out of personal debt traps and/or spend more money in their local economies and contribute to local growth. “It is an evocative concept, but is it even possible and could it work? The answer to both questions is yes. Central bank-financed fiscal stimulus would be the logical endpoint of the unconventional policies we have seen from central banks since 2008. Non-traditional thinking, and weird socio-economic alliances, might be the next big trend. Certainly this is what colours a new book by Stewart Lansley, a visiting fellow at the School of Policy Studies, University of Bristol, and author of several books looking at the economics of inequality. His book is called The Sharing Economy but has nothing to do with the likes of Uber or airbnb, more commonly associated with another type of ‘sharing economy’ (though cynics among us attribute it more to looser employment contracts and transporting people’s stuff on your own bike). Rather, when Lansley talks about the sharing economy he talks about the extent to which we should all expect to enjoy the fruits of national prosperity, where currently this is not the case. In the context of austerity, it denotes the fact that there are some people in contemporary Britain who despite contributing to national prosperity cannot even afford to eat breakfast. Even though we are a rich country, Lansley details very clearly the contemporary problems of inequality we still face: the diminution of ‘counterveiling power’ (or the reduction in ordinary folk having a say in how things are run), the upward extraction of existing wealth, the [poor] treatment of employers, the undermining of the democratic process, business scandals (think Panama! ), and corporations that have become ‘too big to fail’. In place of this Lansley calls for the creation of social wealth funds. Think sovereign wealth funds, which are funds for investment, but rather than exploiting natural resources (as is commonplace in the latter) social wealth funds would come from taxes on unearned income and invest in transport, housing, urban regeneration – things from which we all benefit and are extracted from wealth that we’ve all created but too often see nothing of. 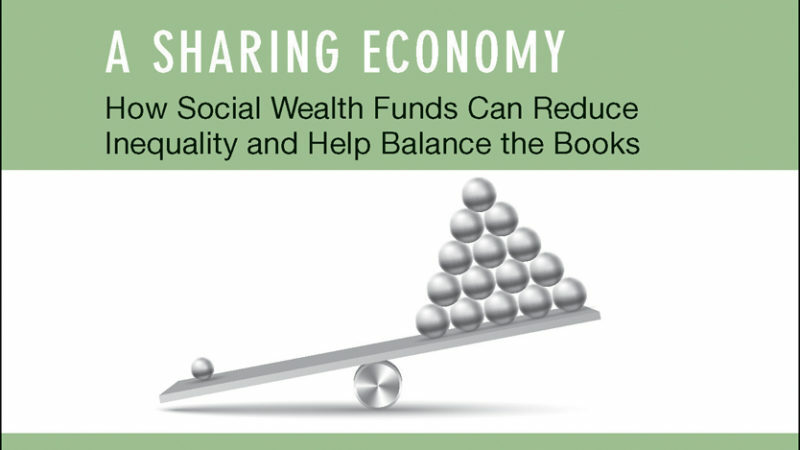 One other aim of social wealth funds is to fund a citizen’s income, another subject on which a weird alliance between Friedman-esque Libertarians and leftists is born. One heart-breaking part of the book is to learn that if a fund had been set up in the 1980s, when North Sea oil and gas revenues were worth around three per cent of the economy, it could by now be worth around £850bn. Just think about every Briton losing a lottery ticket worth £13,000. That’s what happened! Keynes expected that by now our only financial and employment worries to be what to do with our spare time. Lansley reaches (nearly) the same conclusion. With so much wealth in the land, that we’ve all generated, we might at least contemplate a scenario where we are not overworked and under-productive. We are a long way off taking up Lansley’s offer of a social wealth fund, but it certainly is a good idea. Corbyn has talked about QE to do just this before and been pilloried for it by those ‘free speech/thought ‘ press barons. Aim of which to enrich our public services and transform our local landscapes. Yet from day 1 most of the media prefer to focus upon drip dripping anti Corbyn tales than consider an alternative to the FM fundamentalism status quo. Hopefully this book will continue this much hijacked conversation. “Quantitative easing is an unconventional monetary policy in which a central bank purchases government securities or other securities from the market in order to lower interest rates and increase the money supply”. I dont need to check what “bailing out the banks means” but it seems Carl Packman needs to have it explained because it is not the same as QE. “Bailing out the banks” is when a bank runs out of money and cannot carry on operating and the government of that time buys the bank and gives the bank money to keep trading. As I say this has nothing to do with QE. Err Richard they are the same thing both mean money has to be injected into a place be it bank / economy and BTW bank did NOT end up with no money. What happened was there Bad debts were exceeded by the money within the banking system, so could suffer a run like with Northern Rock. If the stupid bankers didn’t as usual want to be a smart so and so selling weird products that none understood what it really is. Even worse in America giving mortgages to people with awful credit ratings. That was crazy but to bundle up the bad debts and sell them as good, to other people was Evil ! The Lot of them should be in jail, not sipping Champlain!